A512 - A Sugar Box in the Chelsea shape. Derby posies litho with rose enamelled by hand. Green and gold beads. A513 - “Glendale” - A Coffee pot. As A512 but all green beads. A515 – A bread and butter plate in the Square Chelsea shape. Coloured Chelsea Birds with all green beads. A517 – Vase 1844 Campana Shape with two solid gilt handles commemorating the visit of the King and Queen to the USA in 1939 – See also under Royal Commemoratives. A519 – Edinburgh shape coffee can and stand. Painted landscape all over by “Dean”. The presence of the inverted commas suggests that these were not decorated by the artist himself. Gold edge and foot line. 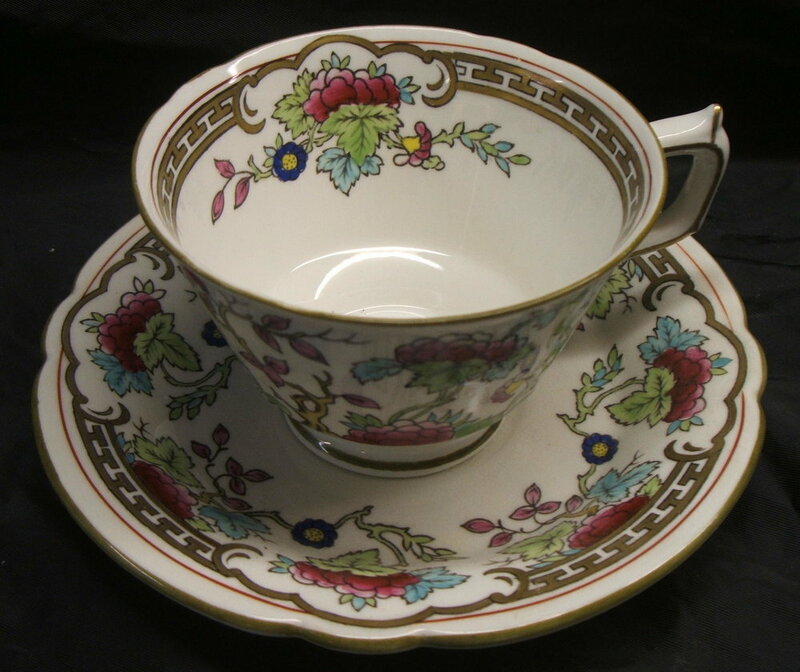 A520 – Chelsea shape Teacup and Saucer. “Grey Scroll Posie Centre”. A524 – Chelsea Birds. Chelsea shape Teacup and Saucer. Printed in purple and enamelled in the same colour. No bead at the edge. A525 – Lichfield Shape dessert plate with plain centre. A526 – Described as a duplicate of pattern 9563 with a maroon ground plus gold printed border and gold lines. That shown above must be a cobalt version. A528 – Another Lichfield shape dessert plate with ivory ground and blue green panels to edge. Gold tracery with gold line at verge. A531 - Chelsea shape coffee can and stand in the “Orient” pattern. See A643 for a differently coloured version of this pattern. 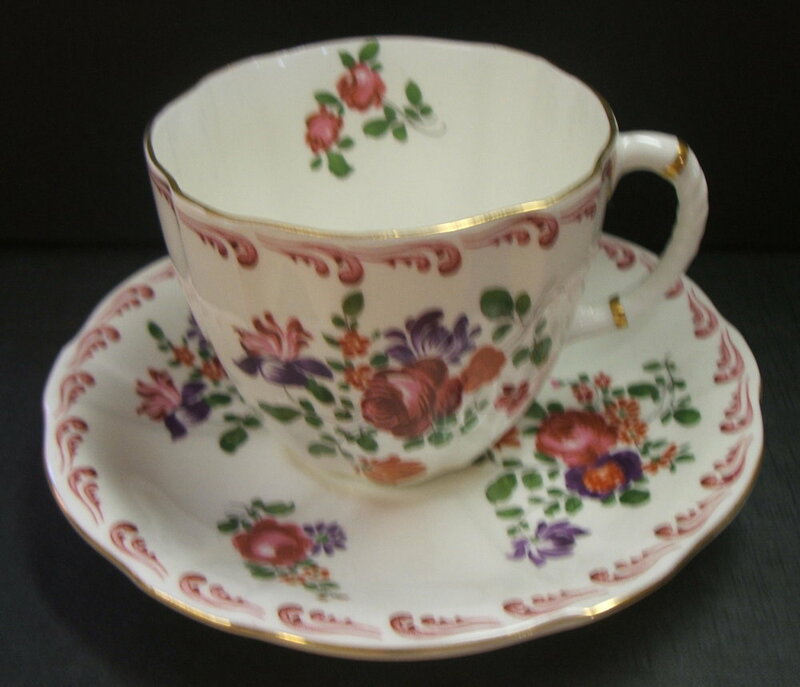 A534 – Tea cup and saucer printed in gold and painted in purple. Two lines in purple with gold edge and line. A535 – Edinburgh shape can and stand. As A534 but painted in red not purple. A537 – Edinburgh shape can and stand. As A534 but painted in blue not purple. A540 – Ely shape plate with cobalt blue ground to rim depth. Hand enamelled “Diana” border over ground. Gold edge. Strong and fine lines at verge. A543 – Ely shaped as A540 but with no ground. Gold line only at verge. No fine gold line. A545 – Edinburgh shape can and stand. Coloured in red, green and blue enamel. A547 – Edinburgh shape can and stand. Pattern printed in brown and coloured in green and purple. A549 – Olde Avesbury but including green enamel. A550 – Gadroon shape dessert plates with Golden Yellow ground. Painted landscapes in square panel by “Dean” in brown. I have seen these plates as a set of twelve. The presence of the inverted commas suggests that these were not decorated by the artist himself. 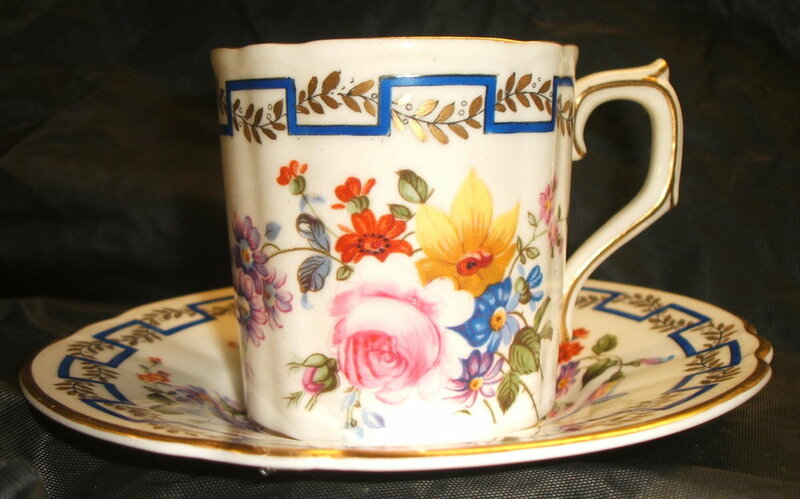 I believe that the Edinburgh shape coffee cup and saucer is in the same pattern, but it is not marked as such. A553 – Described as in the “Mostyn” Shape having a Golden Fawn ground and painted landscapes by Dean. I have not been able to establish what the “Mostyn” Shape looks like so have included several possibilities with those above having Montreal Green and Golden Fawn grounds. No doubt further research will provide a definitive answer. A554 – Gadroon shape dessert plate with Rose du Barry ground. Chelsea Birds centre printed in purple and coloured as pattern A498. Actually listed as being in the Mostyn shape. A555. Gadroon shape dessert plates with Golden Fawn grounds and square panels. All are marked “Plummer, New York City”. Originally a set of twelve, only ten could be purchased. There are four different printed designs, all variously hand coloured, so all appear different at a glance. Signed “E May” which is presumably another generic name as per “Barlow” and “Garnett”. A561 – Lichfield shape plate with centre decoration as used for A569 “Beaumont”. A563 – Plain shape. The outline to this pattern is printed in brown and the blue is underglaze. Red tracing and enamel. This example has a plain centre. A562 is the same plate but with a centre. A564 - My representation of this pattern. Talbot/Tavistock shape with golden yellow ground extending below shoulder. Brown coloured printed rose centre. Seen as a set of 12 and marked Tiffany & Co New York. A567 –Chelsea shape teacup and saucer. As A496 but omitting the centre – thus “Purple Scroll Plain Centre”. 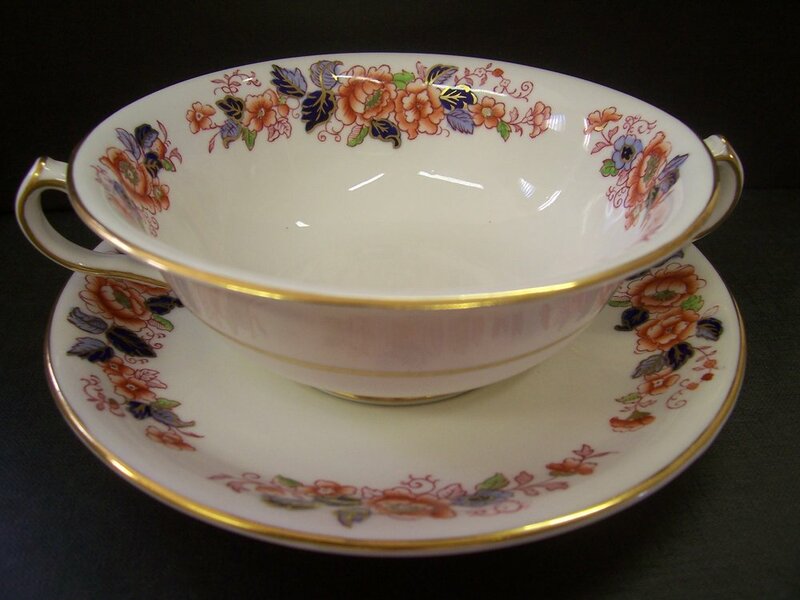 A569 – “Beaumont” here as a coffee cup and saucer in the “Beaufort” shape but this popular pattern also appears in the Chelsea/Ely shape. Printed in grey with blue under glaze. Reprinted in red with large flower enamelled in red. Slightly traced in gold with gold edge. A572 – Gadroon shape dessert plate printed in black and coloured in blue, yellow green and red. Two gold lines. Same pattern as A585 (not shown) and A592. A576 – Plain shape. Printed in brown with blue underglaze. Coloured red and gilt. A594 (see below) is this pattern without an inner border but with a plain centre. A595 (not shown) is this pattern with an inner border but with a plain centre. A577 – Ely Shape. As A495 ”Green Scroll” but omitting the Derby Posies flower centre. A578 – Ivory ground all over. Chelsea Birds as A498 but printed and painted in red. No bead at the edge. A580 - Dessert plate in the rare Rugby shape (Shape 624) and hand coloured in chrome green. A581 – as A580 but coloured in Windsor blue. A587 - Plain shape printed in 4203 green and enamelled in Aidney's blue green. Tiffany factory mark. A591 – Dessert plate in the Clarence shape. Coloured Chelsea birds centre. Embossment traced in gold. No bead at edge. A592 This is a miniature but the pattern book lists a Square Chelsea teacup and saucer printed in black and coloured in blue together with chrome yellow/green and red enamel. A594 is listed in the plain shape but here is shown in the Ely version. It is the same pattern as A576 but without an inner border and with a plain centre. A597 is in the Royal Gadroon shape. The pattern is known as “Leroy”. This version is printed in brown with a Montreal Green ground. Blue/green panel with scarlet enamel spots. 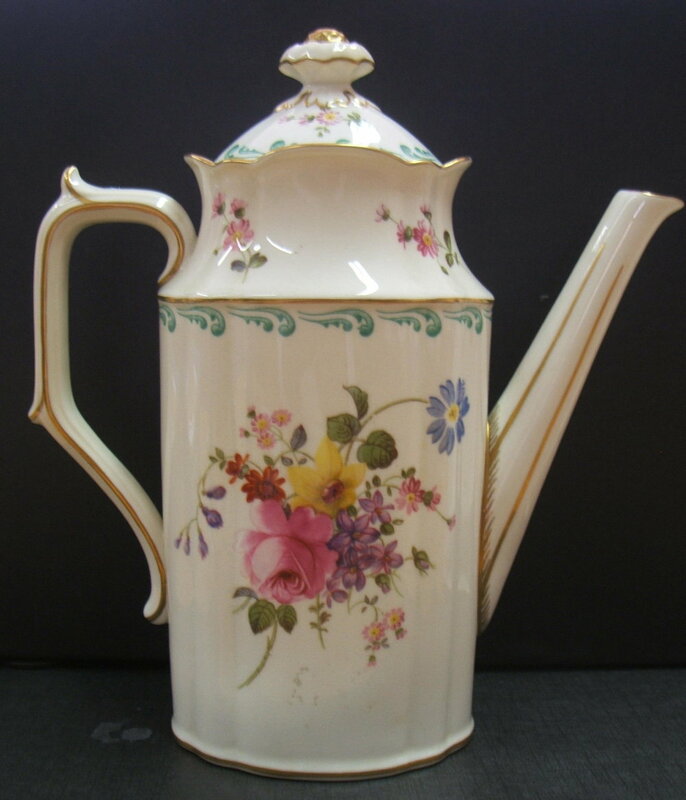 Enamelled flowers. Flower centre and four other flower sprays. A599 – Ely shape teacup and saucer. Cobalt ground with ivory ground. Posie litho sprays and group in centre. Gold line in centre in this version, but Cassidy’s (Department store) apparently contacted Harold Taylor Robinson who left a pencilled note in the pattern book: “to be done with scalloped centre for Cassidys 599 in future HTR” This later became known as A616 “Matlock” - see below. 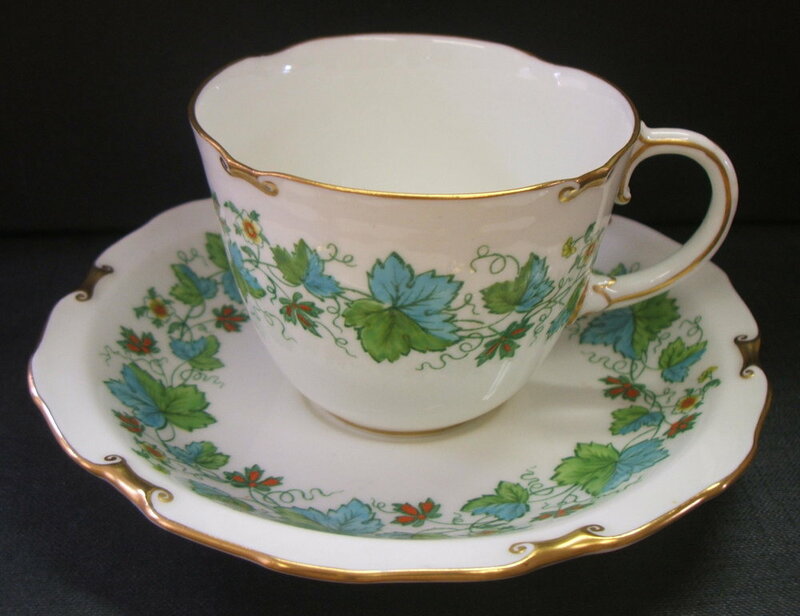 A603 – Teacup and saucer in the Surrey shape. As pattern A513 but the bead is in purple. Known as “Glenmont”. This version is entirely hand painted -apparently freehand and shows remarkable artistry – do compare with the pieces in the “decorated by others” section. The other set listed under A513 is in the Chelsea shape and here a litho is used. 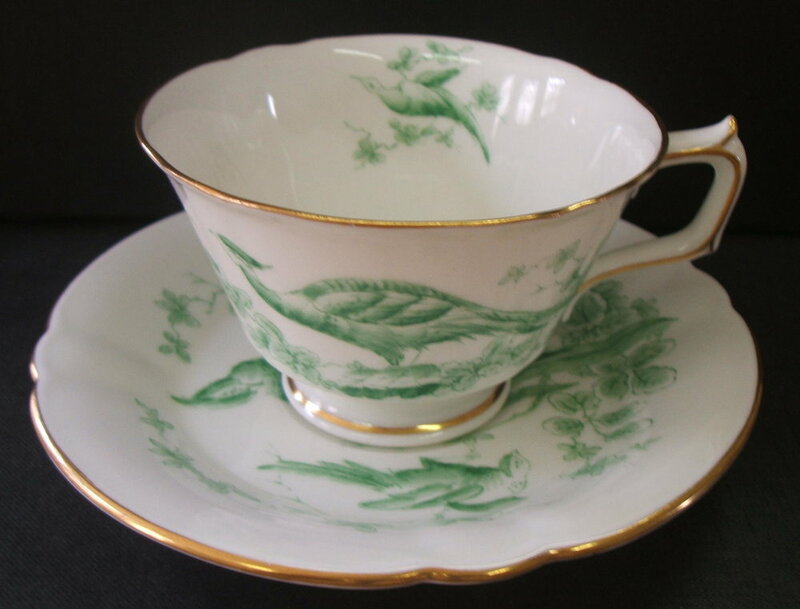 A604 – Chelsea shape teacup and saucer. Chelsea Birds printed and painted in sap green. No bead at the edge. 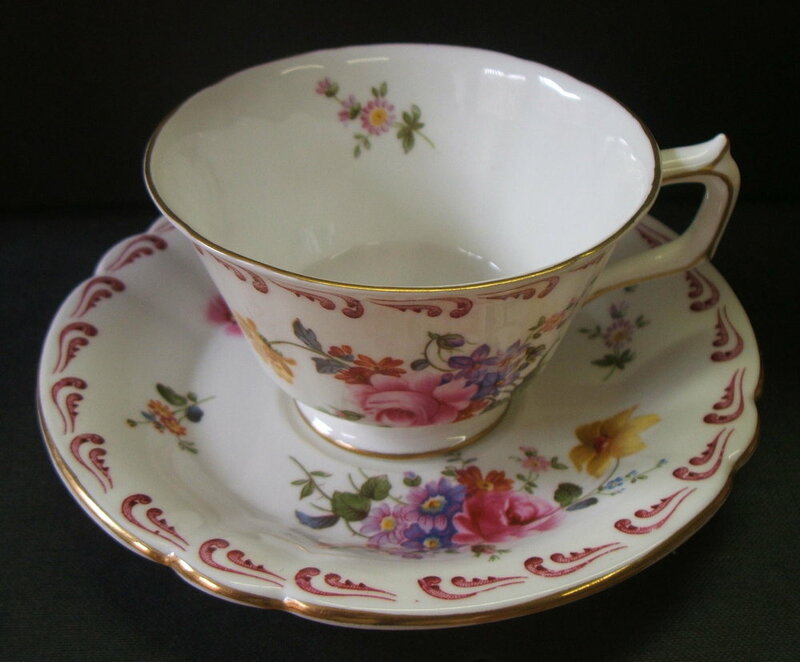 A605 – Chelsea shape teacup and saucer. Chelsea Birds printed and painted in red. No bead at edge. 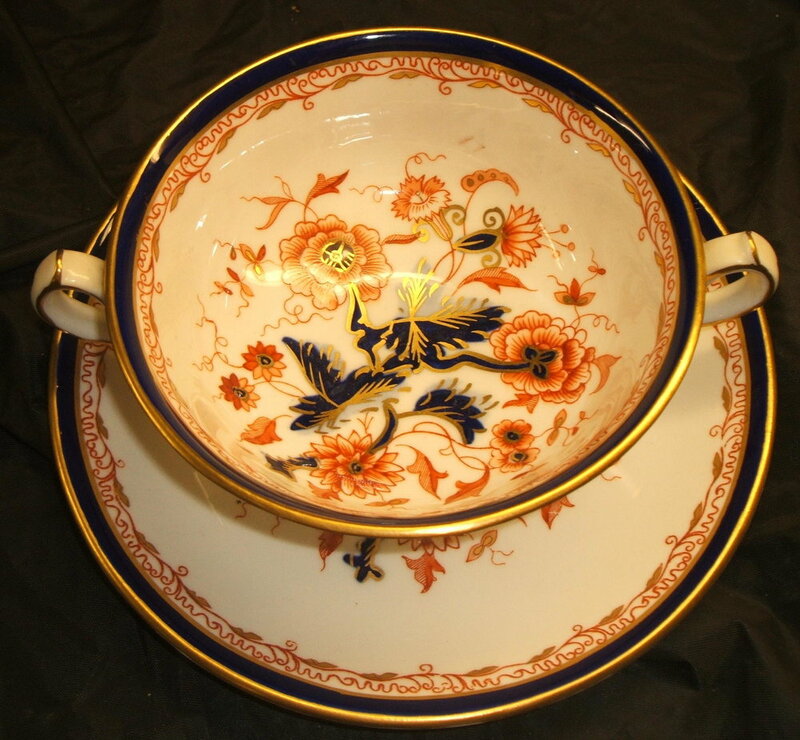 A628 – Plate in the Tavistock shape with cobalt and ivory grounds. The second image is a maroon ground version. A630 – Chelsea shape tea cup and saucer with posie litho sprays, cobalt band (It is actually listed as having a maroon band) and no ivory ground. A940 is a version of this pattern with a Montreal Green ground. Pattern A630 also appears in the Gadroon shape. A643 – Version of “Orient” printed in brown underglaze with matt blue, yellow, salmon, apple green and blue green hand painted enamels. It is very difficult to discern any real difference between this version and that marked A531. There would inevitably have been some variation depending on who enamelled the piece, and some colours would have changed in the firing process. In comparison the colouring in respect of A643 seems more restrained. 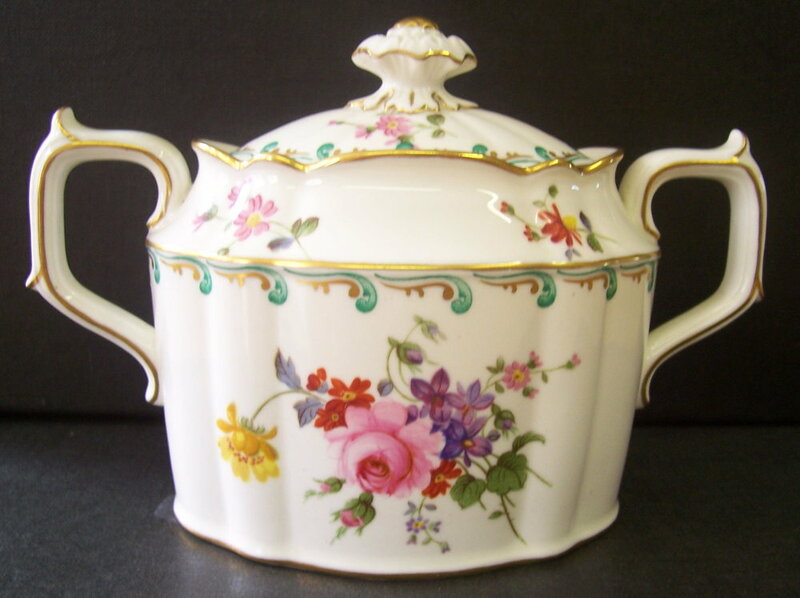 Here are shown a sugar box and tea cream in the Chelsea shape, together with a Surrey shape teacup and saucer. A645 – Two Stanhope shape plates with Duesbury green grounds. Landscapes by Dean printed in brown. A652 – Ely shape plate with ivory and Duesbury green grounds. Pattern printed in red and reprinted in gold. Red enamelled flowers. A706 (not shown) is a version of this pattern in Montreal Green. A657 – “Cotswold” litho centres on small size Bedford Sweets (See Fancies). Gold Edge and line to grounds which include Golden Fawn, Pea Green, Duesbury Green, Montreal Green, Maroon and Rose du Barry. The Lithos for this pattern were apparently supplied by Capper Rataud Ltd, an important lithographic and screen print manufacturer based in Stoke on Trent. A note suggests that this pattern is not suitable for the smallest size Bedford Sweet. Two sizes are shown above. A668 – Pastoral scene printed in blue with gold edge. Listed as being in the Devon shape, this version is in the Dover shape. A674 Devon shape plate with gold printed star. Embossment traced in gold. A676 Devon shape plate with posie litho centre. Embossment traced in blue green and golden brown. Gold edge. A678 – Two plates shown here with different litho posie centres and gold edge only. 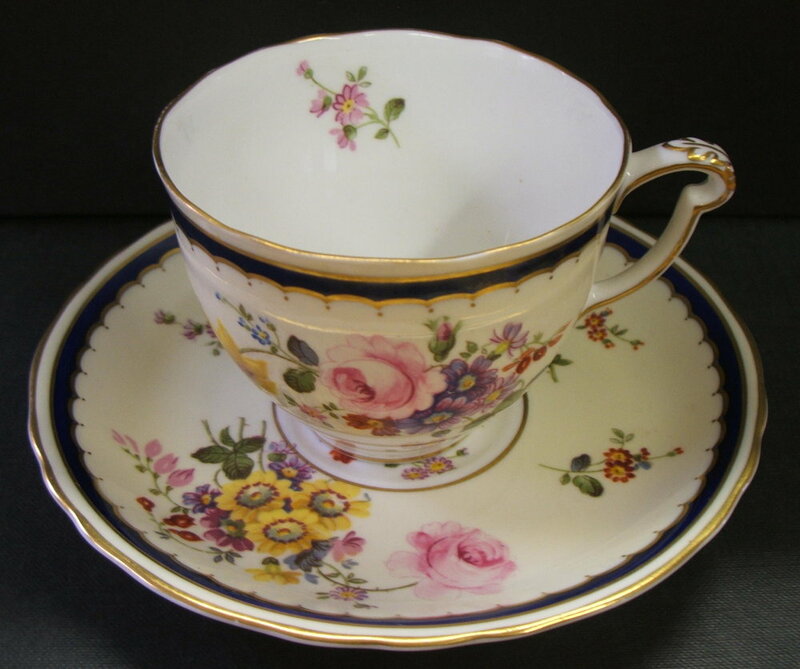 A680 – Chelsea shape teacup and saucer. 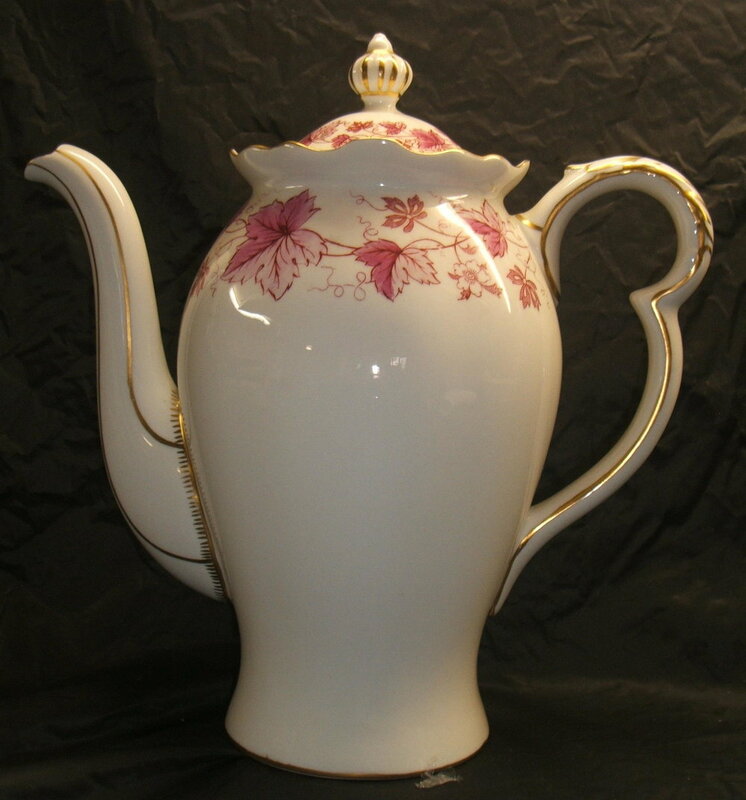 This pattern is called “Indiana” and is Royal Crown Derby’s version of the “Indian Tree” pattern. Printed in brown over glaze. Gold edge. Printed red line and coloured in blue green, yellow green, blue, orange, pink and yellow enamels. A692 – A pair of vases, compana shape 1763, with beading on foot and edge. Green grounds and panels by Dean. A696 – Plate in the Ely shape. Pattern printed in grey and coloured in lemon yellow, golden orange and yellow green enamels. 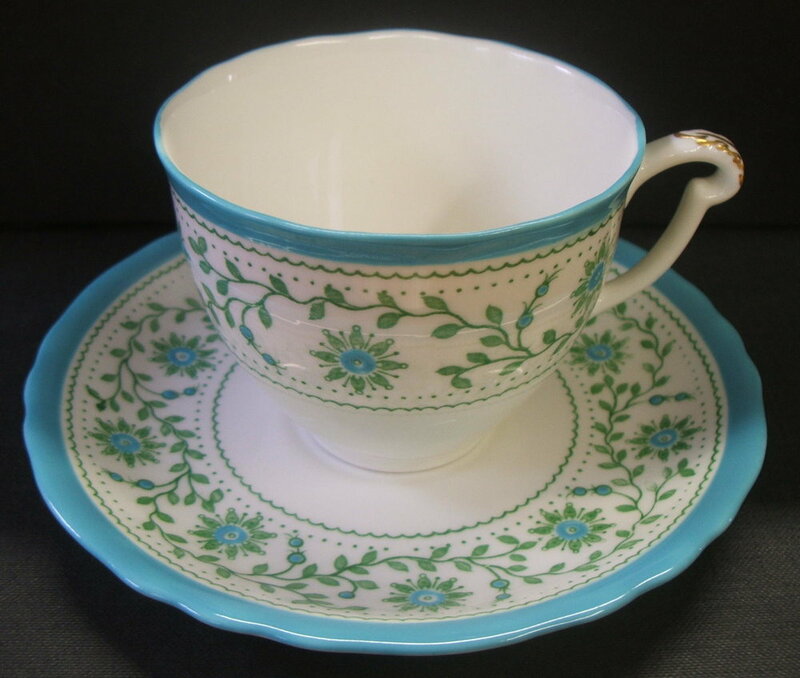 A697 – Ely/Chelsea shape coffee cup and saucer with powdered apple green ground and posie sprays. A699 – Silver shape plate with maple leaf pattern printed and then coloured by hand in red. Reprinted in gold with hand gilt edge and scrolls. 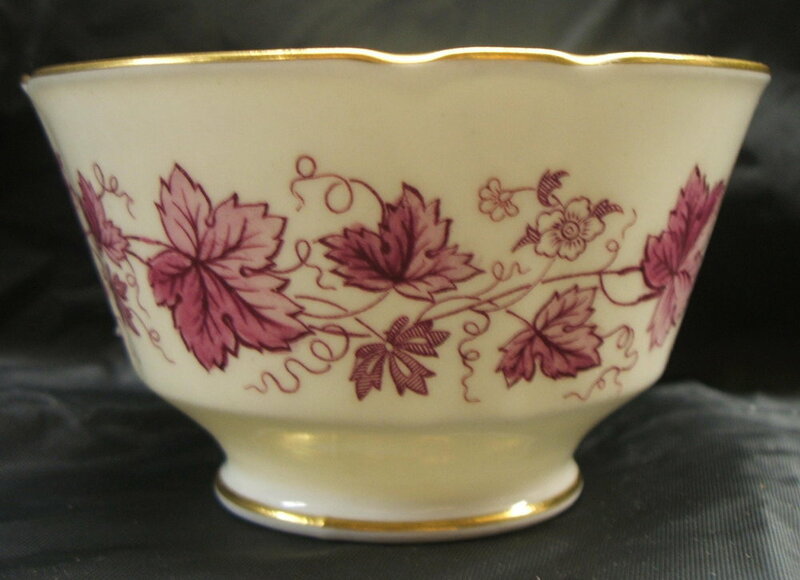 A700 – “Mayfair” Here shown as an oval covered dish. A version of A699 but the pattern is printed in grey and hand coloured in golden orange, lemon yellow and scarlet. A701 – A version of A699 but printed in green and coloured by hand in blue green, yellow green, lemon yellow and scarlet. A705 – Chelsea shape teacup and saucer with pattern printed in grey. Maple leaves coloured in golden orange and lemon yellow. A706 (Not Shown) is a version of pattern A652 but with a Montreal green ground. A713 – Maple leaf printed in purple and hand coloured in the same colour. Shown here in the Chelsea, Ely, Silver and Surrey Shapes this pattern was used as an every day service in Derby's Rambys in store cafe - (Now Debenhams). 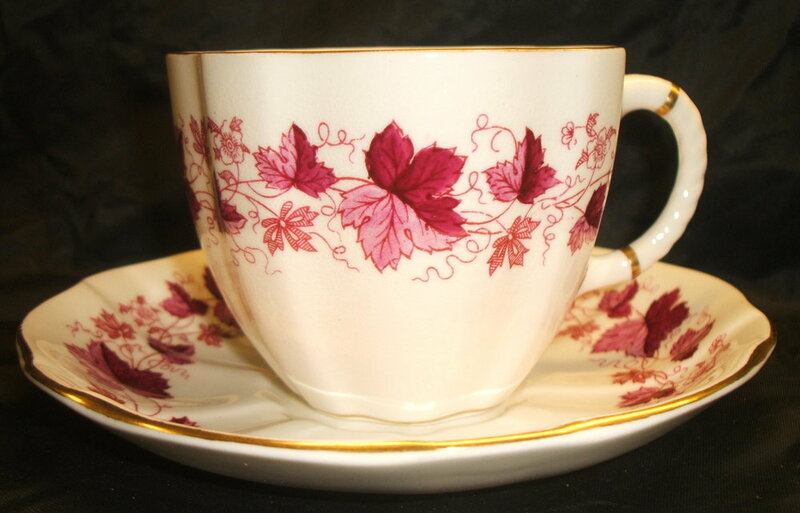 A714 – Silver shape teacup and saucer with maple leaf pattern printed in brown and hand enamelled in red. A718 – Talbot shape plate with “Garnett” centre (The pattern book lists posie) and ground of two coats of pale maroon for pink. A720 – Soup and stand. Cobalt blue ground with pattern printed in grey and red. Hand painted in red and gilt. A721 – Soup and stand. Pattern printed in crimson under glaze. Blue ground then applied and then hand painted in red and yellow green. 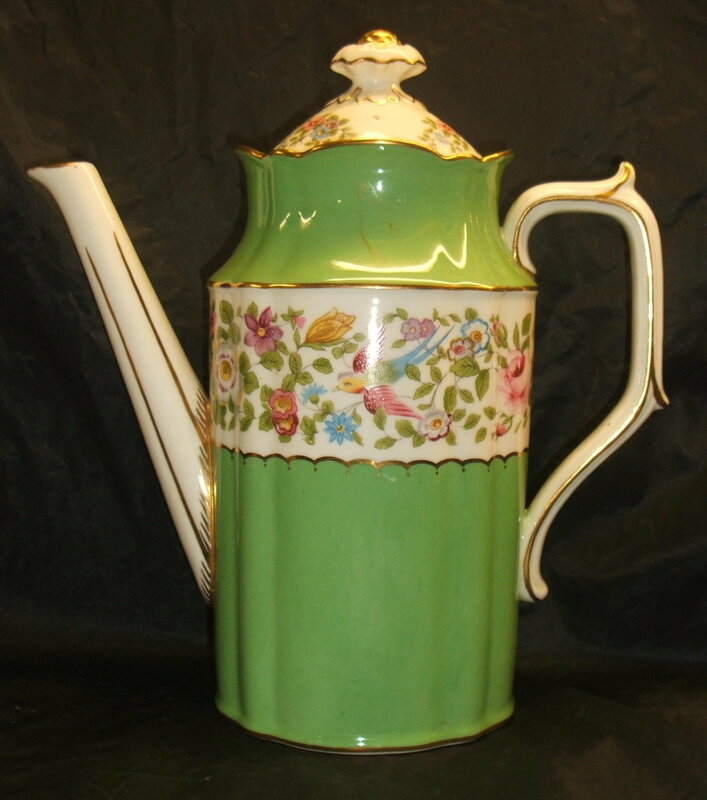 A724 – Ely shape plate with ivory ground, posie sprays and a band of underglaze green. A green version of A616 Matlock. A730 – Here shown as a plain shape plate this more usually appears in the 1950 duchess sweet shape. Enamelled in red and yellow green. 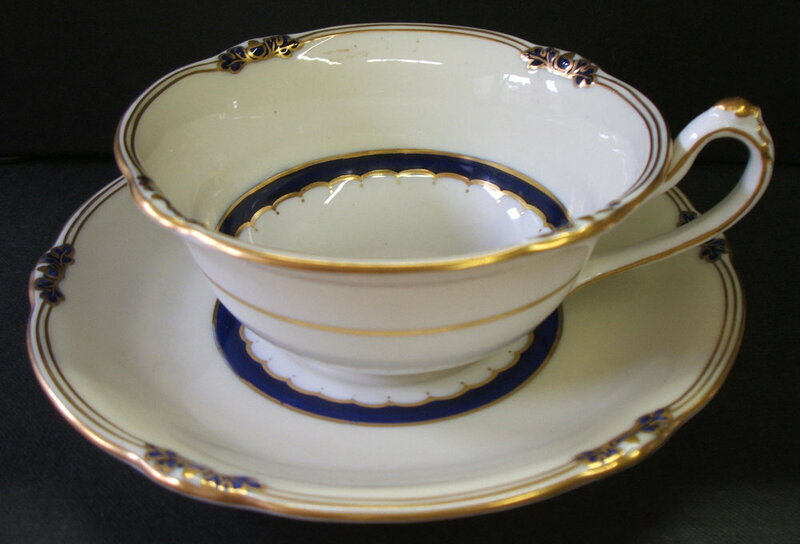 A733 – Coffee cup and saucer in the Chelsea shape. Printed in grey for addition of blue ground. Reprinted and enamelled in red. Gilt. A version of A680 Indiana but differently coloured. A736 – “Spring”. Chelsea shape coffee cup and saucer with pattern printed in black with Greek key in blue and gold. Litho posie sprays. "Spring" was also produced in the Surrey shape. 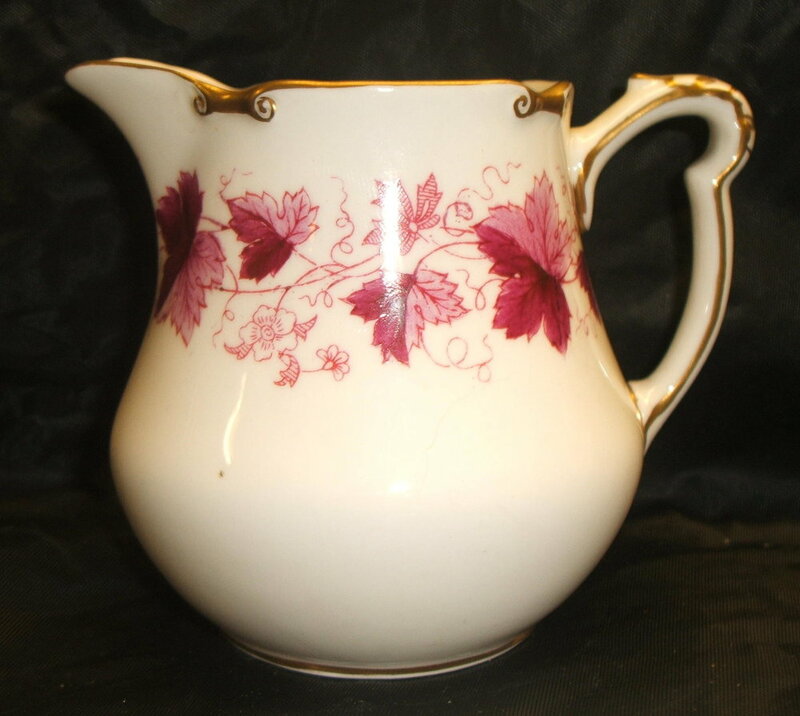 A milk jug and sugar basin are shown above. A738 – Silver shape plate. “Cotswold” pattern but with the addition of a powdered celadon ground. A749 Silver shape cup and saucer. Leaves painted in printers red and painted in 3413 red. Gold print.